Note: Use your back arrow to return to David's website.......if you simply close the youtube video you will NOT return to this site. "Anemones and Sea Grass" used as cover art for "Professional Artist Magazine". 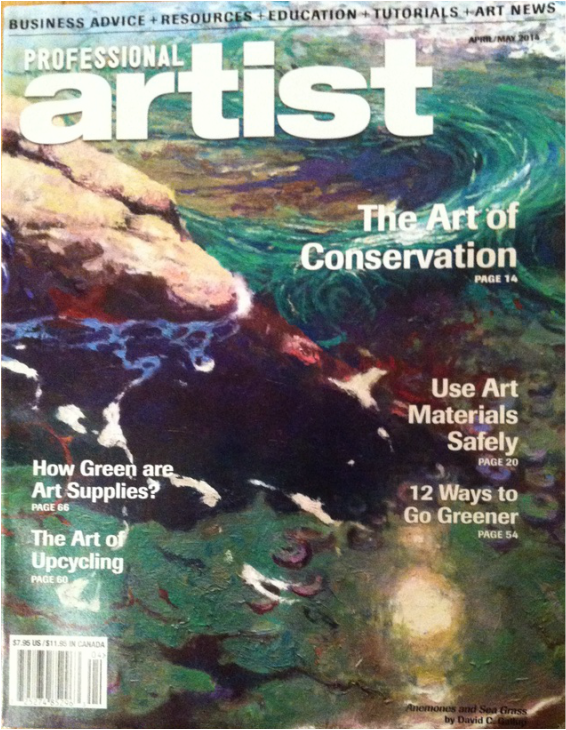 Gallup's painting "First Light at Yellow Banks" was featured on the cover of "American Artist Magazine". A ten page spread on Gallup's work was featured in the magazine. Other artists featured this month were Timothy Thies and Andrew Wyeth. Gallup's painting, "Twice Humbled" won one of the most prestigious awards given in the art world today, the California Art Club's Gold Medal for Best Painting. The Frederick R. Weisman Museum hosted Gallup's first solo museum exhibition, "Nature's Masterpiece~ California's Channel Islands" in Spring of 2011. The exhibition also showed in other museums around the country. The Huntington Botanical Gardens and Fine Art Museum has purchased Gallup's 2002 painting, "Huntington Memories" for it's permanent collection. The organization is well known nationally for it's impressive collection of important American and European artists. The Cheesecake Factory has commissioned David Gallup to do it's official portrait of it's founders, Oscar & Evelyn Overton. The company went public in 1992, and was the first restaurant chain to reach a billion dollars in revenues with fewer than 100 restaurants in operation. It is now valued at over six billion dollars. Gallup's portrait of the Overtons hangs in their corporate headquarters in Agoura Hills, CA. Artists for Conservation, a worldwide artists group Honors David C. Gallup with it's "Conservation Artist of the Month" award for his work with the Channel Islands. Previous recipients have included Robert Bateman, John Banovich, David Shepherd, Simon Combes, Gamini Ratnavira, and Pollyanna Pickering to mention a few. 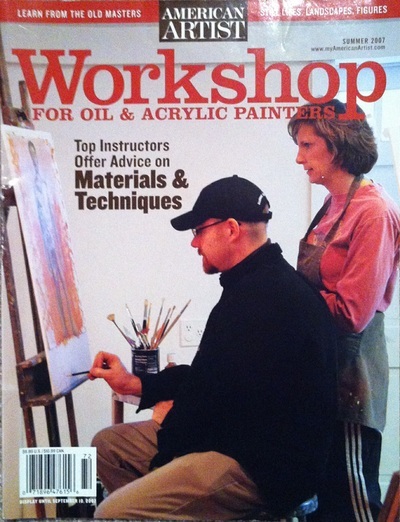 Workshop Magazine, a quarterly publication put out by American Artist Magazine has an in-depth feature of Gallup's 2006 plein-air workshop from Rock Island, Tennessee in the Summer 2007 issue. The article is entitled "Making Color Sing", by Alison Malafronte. She joined Gallup for his weeklong workshop in Tennessee in 2006 and turned her experience into a wonderful article giving highlights of Gallup's color theory as it relates to music, and what he finds important in art. Several student works from the workshop are also included, along with Gallup's critiques given to those paintings. You're sure to find it an enjoyable read and a wonderful magazine both for the aspiring serious artist and for the collector who would like to have a better understanding of what goes in to making a painting. Art of the West Magazine highlights the life and work of David Gallup in the September/October 2006 issue. The article is entitled "A Constant Adventure", by Mary Nelson. It explores Gallup's philosophy, background, and how his personal development impacts his paintings. The California Art Academy and Museum has acquired one of David Gallup's major works for it's permanent collection. The painting, "Origins", is a depiction of Yellowstone's Black Pool. It was displayed to the public in April of 2006 at the Pasadena Museum of California Art at the California Art Club's 95th Annual Juried Exhibition. The acquisition marks the first time a museum has acquired one of Gallup's major works for it's permanent collection. This is considered to be a major milestone within the industry, and validates Gallup's recent arrival as a prominent American Artist. David Gallup will be the focus of a High Definition documentary exploring the process of creating his upcoming show, "The Channel Islands Experience". The film is being produced by "The Essential Image Source Foundation". To learn more about this collaboration visit their website at WWW.EISF.Org. 17 Interviews with 17 Successful Visual Artists, a new book by James Leonard-Amodeo, features an in-depth interview with David Gallup. Where can you buy it? Visit Sierra-Arts.net. International Museum of Contemporary Masters of Fine Arts Salon 2004 awards Gallup's "California Daydream" three ribbons, including the prestigeous "People's Choice Award", "Jury's Top Fifty Award" and the "Honorable Mention" awarded by Pino D'Angelico. American Artist Magazine reviews Gallup's contribution to the Weissman Museum's "On Location in Malibu" exhibition. Written by Weissman Curator Michael Zakian. 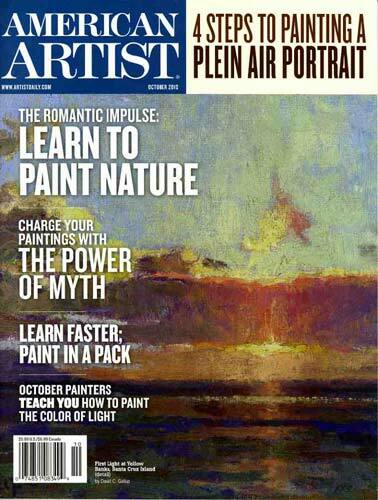 AskArt " The Artist's Bluebook"
Southwest Art Magazine "Artists to Watch"